Mudpies to Dragonflies: Come on in! Boys! 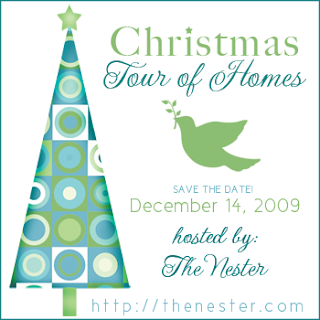 Hurry up and let's get the house ready for all the bloggers on the Christmas Tour of Homes. I'll need your muscles! Okay, bring the Lego Advent calendar into the hallway. Set it up next to the Advent banner and our little nativity scene from Grandma. Who is going to open the little window? Okay. Now that Dad has the tree in the stand, how 'bout some Decorating Super Heroes? While you guys do that I am going to put my little Santa on the piano. I'm going to look for the tree skirt while you get the new train going, Sam. The tree skirt is under the tree and I put a little snowflake ribbon on the tree. I think the tree is ready! Aaron, will you set up the kids' nativity scene in the living room? Here is the North Pole scene for you to put up, Dave and Sam. Sam, I brought this new Playmobile nativity from my classroom. Will you put it on the lamp table in the living room? Aaron, will you add these cards to the card holder? Here are a few new signs to hang. Aaron, when you are done with that book please put it in the Christmas book bin. Dave, put the Christmas stuffed animals in the basket. Sam, let's find a place to put your Jesus candy cane. And how 'bout Aaron putting the wreath on the door? Everybody outta the dining room... breakables! We're going to need some treats on that new Santa plate, Dave. Our guests might enjoy a chocolate cupcake with chocolate ganache and white chocolate cream cheese peppermint frosting. Okay, I think we are ready. Honey, will you turn on the outside lights? Let's welcome our guests. Smile, boys! this Christmas and all year! Adorable boys! Your home is lovely, that tree is amazing. I've always wanted a train around my tree! Great idea, I'm sure it sounded just like that while you guys were decorating. Those cupcakes sound yummy! Everything looks so pretty, and it looks like everyone had FUN! I love how you're using your cake server as a centerpiece! That is so pretty! What adorable boys! I love your manger. That was fun! Where do you find the time. Amazing. Oh how I love boys! Raising three is quite a thing isnt it? I think there will be a special place in heaven for us moms of three boys! Your home is just beautiful! :) Merry Christmas! So festive! Thanks for stopping by! Beautiful! Thanks for stopping by my blog and for sharing your lovely home. Your boys are so handsome, not to mention helpful! So many beautiful decorations! With a 2 year old boy I am just happy to get the tree up and some presents wrapped. I still have cards to do- whew! Love your decorations and your willing little helpers! I liked the getting ready for company idea! What handsome boys! They really make Christmas. It looks like you had so much fun with them. My grandaughters have that nativity and just love playing with it. The four year old calls it Mary, "Jofus", the Baby Jesus and the "wives". I love it! Thanks for stopping by my blog and leaving such a sweet comment. Well that was FUN!! :) The cupcake looks great! YUM! And I LOVE the picture of your son under the tree checking out the train set. That is a keeper. I love your place, and your tour. LOVE the various nativities - Fisher Price, Lego(??! ), Playmobil ... so neat. Also, my mouth is watering from the chocolate cupcake. Blessed Christmas to you and your family - your boys are just precious!! Thank you for visiting me, also! Your house looks great and your boys sure do look excited for Christmas! Not too much longer!! What adorable kids you have, thanks for visiting my blog today. I love your tree and what a great picture with the lights that looks like diamonds, how did you do that? Beautiful, love the nativites they are great. Keep in touch. Add a Lego Nativity to my list of "necessities for next year." LOVE all the nativities! Thank you for your comforting words today. I will keep them in my heart. yes! let's hear it for a kid friendly home @ christmas!!! i am all for it. and those sweet manger toys. we have the FP, but right now, they all can't stay in one place. perhaps, when they get a little older??? take care. only. four. more. days!!! We need a Christmas book bin! I always start finding the Christmas books buried deep AFTER Christmas...everything looks so lovely and festive! Thanks for the visit today :)! So nice to meet you! LOVE your tour, funny how many similarities we have in decorating. I guess we are both just doing the best we can living in all boy houses HA! Merry Christmas! We have that same Little People nativity set! In fact, both of my kids have one underneath their trees!